The gent's style also includes:- Chocolates, wafers, cookies, hot chocolate mixes and fruit jellies. On request we can adapt more savory and would omit chocolates in high summer. 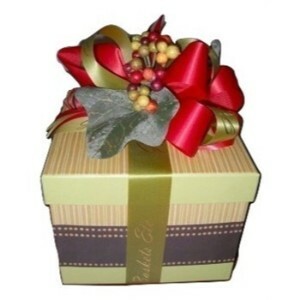 Packed with colorful shred and tissue plus Berry and Ivy stem within the bows with bright and color contrasting ribbon, making it a highly adaptable gift.